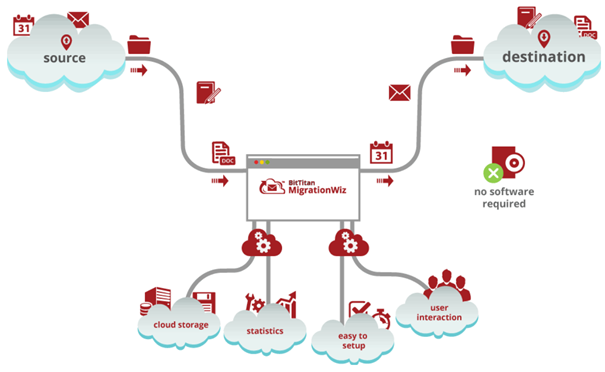 MigrationWiz is offered at a cloud service and running in various datacenters throughout the world. This way the best migration performance can be offered. MigrationWiz is currently using datacenters in the North America, South America, Western Europe, Japan, Australia and Asia Pacific. So, for my migrations in Europe between European Exchange deployments and Office 365 (which are running at the Microsoft datacenters in Dublin and Amsterdam) I can get the best performance when using the MigrationWiz services in the Western Europe datacenters. There are various platforms that are supported out of the box like Exchange 2003 or higher, Office 365, IMAP platforms or Groupwise and Lotus Notes, but you can also define a custom service provider. Figure 2. There are various source platforms available out-of-the-box in the MigrationWiz solution. Figure 3. Multiple destination platforms are available as well. Most of my migrations are related to Exchange on-premises or Office 365. 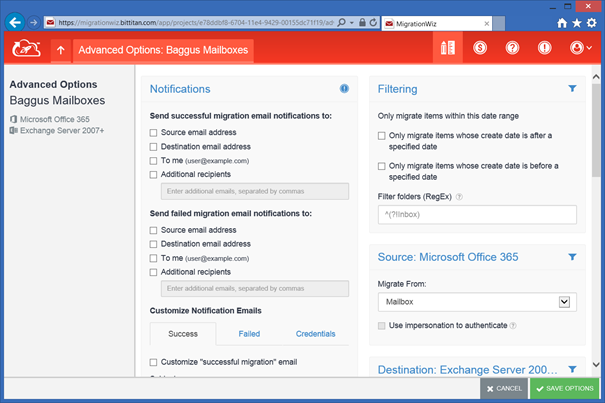 When performing an Exchange migration, not only mail, calendar and contact items are migrated, but all folders in your Mailbox, including rules (and out-of-office) are migrated from Exchange to Office 365 and vice versa. Creating a new project is fairly easy. 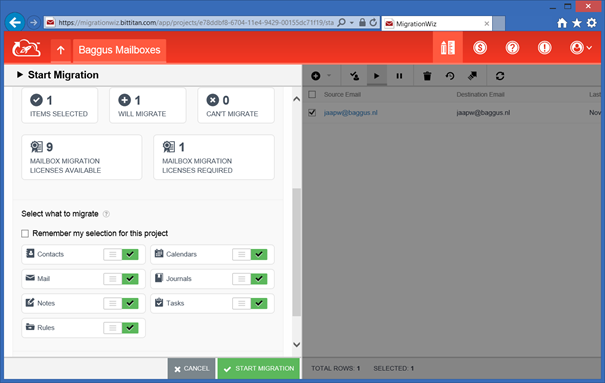 Logon to the MigrationWiz portal, select Go to My Project and select New Project. The next step is to define what kind of Project you want to create, or what kind of content you want to migrate. Figure 4. There are different Project types available for different data types. In this example I want to move Mailboxes (from Office 365 back to an on-premises Exchange 2013 Mailbox) so I’ll select Create A Mailbox Project and give the Project a name. 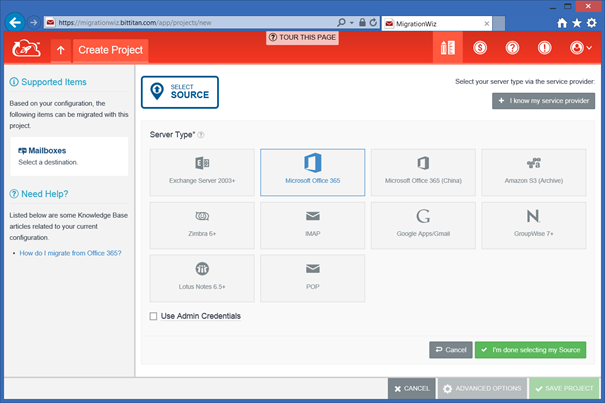 Enter a Project Name and Click Select Source to select the platform where the Mailboxes are currently hosted, in this example this if Office 365. Figure 6. Select the source platform. You can check the Use Admin Credentials. In this case this admin needs full access to the Mailboxes you want to move, adding the admin to the Organization Admins group in Office 365 simplifies the process, but this is not really a requirement. Select Microsoft Office 365 and click I’m done selecting my Source. The next step is to select the destination platform, which in this example is an Exchange 2013 platform. Figure 7. Select the destination platform. 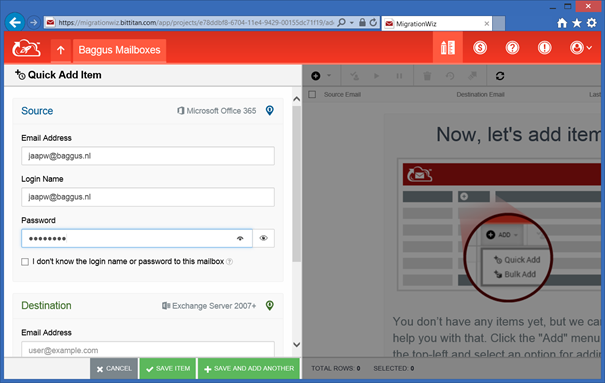 Select Exchange Server 2007+ and enter the Outlook Web Access URL. MigrationWiz uses this URL to construct the Exchange Web Services URL. When you’ve entered this URL click I’m done selecting my Destination. The Advanced Options menu contains a number of interesting options you might use when migrating Mailboxes. For example, you can set the Use impersonation to authenticate option to speed up the process with Office 365. 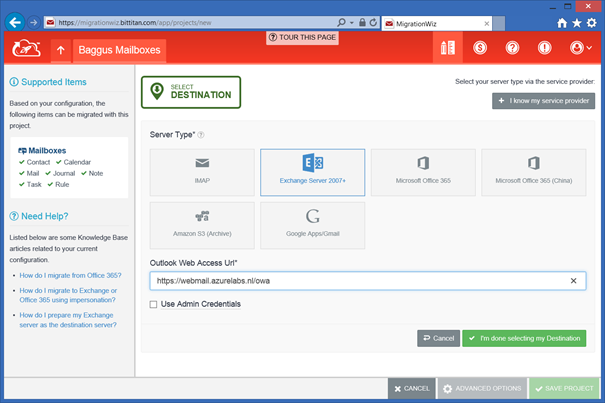 When using the impersonation option MigrationWiz uses the admin account to access the mailboxes, but to avoid issues with the Office 365 throttling policies the connections to Office 365 are identified as different user accounts instead of just one (the admin account). Figure 8. The Advanced options contain a lot of interesting options. When you scroll down you can select the Preferred data center under the Performance section. Since my Mailboxes are located in Amsterdam, and my Office 365 tenant is located in Europe (which means either Amsterdam or Dublin) I have to select the Western Europe data center for best performance. Figure 9. Select the appropriate data center for best performance. Another interesting option I’d like to show is the filtering option. Using filtering it is possible to migrate items up to a specific date which can be very useful if you want to migrate very large Mailboxes. For example, you can migrate items from a mailbox up to 6 weeks ago (like September 1st, 2014 in my example) but have users still working in their normal Mailbox. When you want to switch the messaging system you only have to migrate the remaining items. MigrationWiz will check during migration if items already exist and if they do skip them. 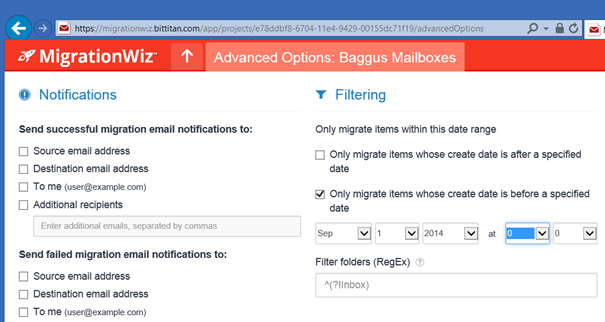 This way you can better schedule the migration of large Mailboxes. One remark though: this is a migration and not a synchronization. When you do this items are migrated from the source Mailbox to the target Mailbox. If a user deletes items before this particular date, the items are deleted from the source Mailbox and not from the target Mailbox. In this situation users will find the items they thought were deleted in the target Mailbox again after you make the switch. This is not only true for MigrationWiz, but for all other third party migration solutions. 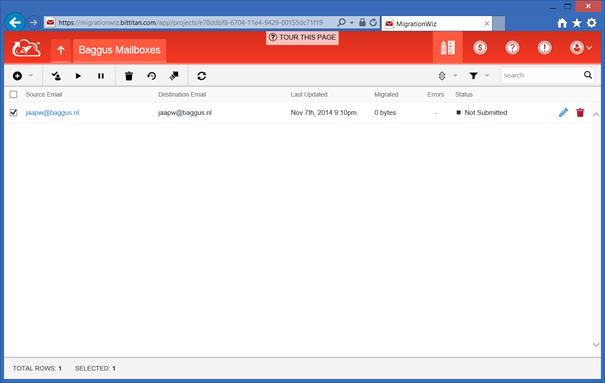 Only Microsoft is able to synchronize the source and target Mailbox in a hybrid scenario. When all options are configured your project is finished and you can add Mailboxes that need to be migrated to this project. Users can be added manually using Quick Add or using CSV files via Bulk Add. Figure 11. When the project is created you can add users manually (Quick Add) or using a CSV file (Bulk Add). 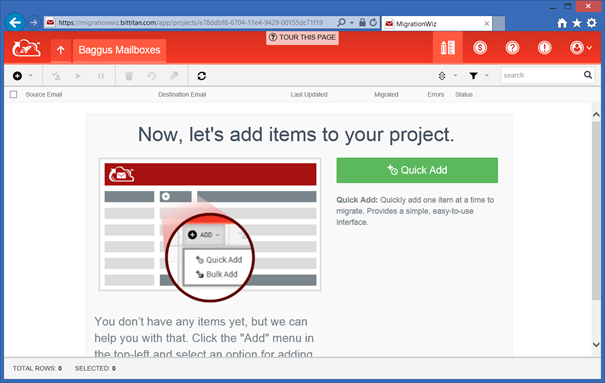 Select Quick Add and you can add the individual Mailboxes to the project. It is possible to use the username/password, but if you don’t know these you can select the I don’t know the login name or password to this mailbox and use administrator credentials to migrate the Mailbox. The first prerequisite is that this administrator account has sufficient permissions to access this Mailbox of course. Figure 12. Enter the credentials of the source Mailbox. You can also use administrator credentials by selecting the I don’t know the login name check box. Repeat this step for the Destination and save this Mailbox item. A list of Mailbox in this project will appear (in my example only one), select this Mailbox (or Mailboxes) and click the start icon to start the migration of the Mailbox. A new window appears where you can select the item type that need to be migrated and whether you want to do a Trial Migration or a Full Migration. Once selected you can click the Start Migration button. Figure 14. 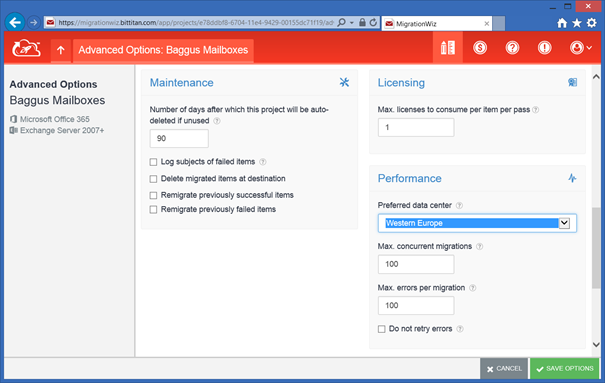 Select the options you want and click Start Migration. When the actual migration is running you can select it to view the details of the migration as shown in the following screenshot. Figure 15. You can find detailed information regarding the migration. Besides the number of items that are migrated you can also find information regarding throughput, the time the migration is running, whether the source or the target platform is being throttled, all kinds of information that’s also retained after the migration. Figure 16. Transfer speed during Mailbox migration. 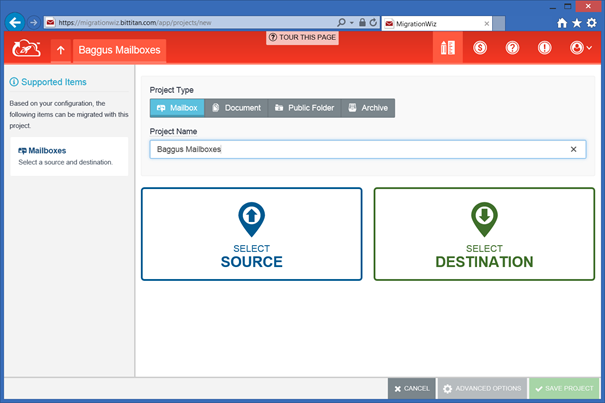 The project and the accompanying data is kept in the MigrationWiz portal for 30 days before it is archived. 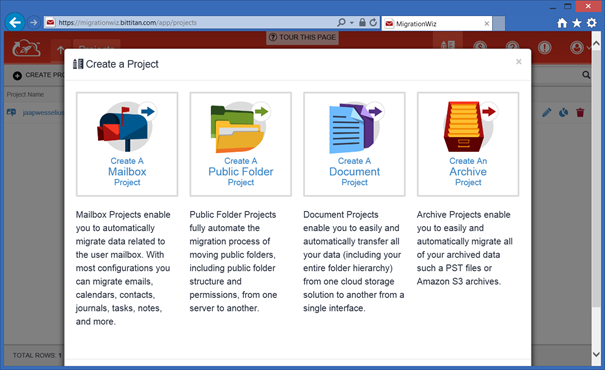 MigrationWiz is an online tool you can use for migrating data from one platform to another and in most cases it’s used to migrate Mailboxes to Exchange Online. It has way more options than the standard Cutover Exchange Migration or Staged Exchange Migration that basically initiate an Outlook Anywhere connection and move all data across. Especially the filtering techniques is what I like very much, but the reporting options can be handy as well.